Okay, Okay- I am not an expert in decorating, but I know what I like and what I don't and I have an appreciation for architecture, art, photography, and natural beauty; and if there is a way to incorporate all of this into my humble little space I call home, then I happily will! 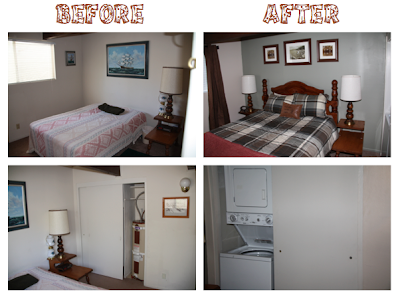 At the latter end of 2012 I decided to repaint the master and gust bedrooms a beautiful grey with warm undertones. Now all I need to do is update the bedding, my husband wants white linens, and this photo is my inspiration. We already have the white linen bench at the foot of our bed, I just need to find the perfect bed linens and add some fantastic photography above the bed...good thing hubby's hobby is taking amazing pics! I have been looking for a way to display Trevor's artwork in the house since he started preschool (he has created some phenomenal pieces of art if I do say so myself), but I have not had a way to properly showcase his work. We have a stainless steel refrigerator, so we can't put any of his work on there, we don't have any free wall space, and taping his work to our cabinets just seems counterintuitive as the adhesive may likely take the finish off of the wood. Finally, it occurred to me! I have been trying to think of something to put above Trevor's changing table since before he was born-I couldn't think of a more well-suited spot! I simply took a frame that I had from Ikea, took the glass out of it, hung it, and taped his artwork right up to the back of the frame-voila! I have an original piece of art in Trevor's room that he is very proud of, and it changes with the unit that he is learning about and/or the season! It is perfect! I love that I can display his work in such a fun and organized way and that it belongs somewhere that fits so well-his room! Now we all enjoy his work when we are getting Trevor dressed for school or the evening, playing or reading and it strikes up great conversations between us and our son! Every room in your house needs decorating, even the "non-room" like the Foyer. The entry into your home is probably the single most important room in our house to decorate, it sets the first impression of your home, so you want the impression that your house makes on your guests to be a good one. Adding chairs like the ones above serve a multitude of purposes, they give your guests the feeling of welcome; it lets your guests know that you want them to stay. Theses chairs are also very mobile and can be used for additional seating in your living space or at the dining table, depending on the party that you are hosting. 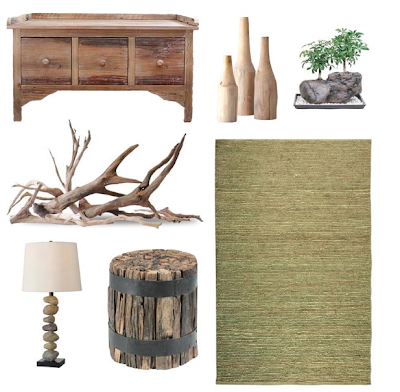 Using a wood table provides for a classic/organic feel that will never go out of style. I really prefer the half-round style of tables, they are unique and provide a little more storage than the standard thin rectangular entry table. Adding artwork and lighting is key even to a small area like the foyer, as it sets to tone for the rest of the house. 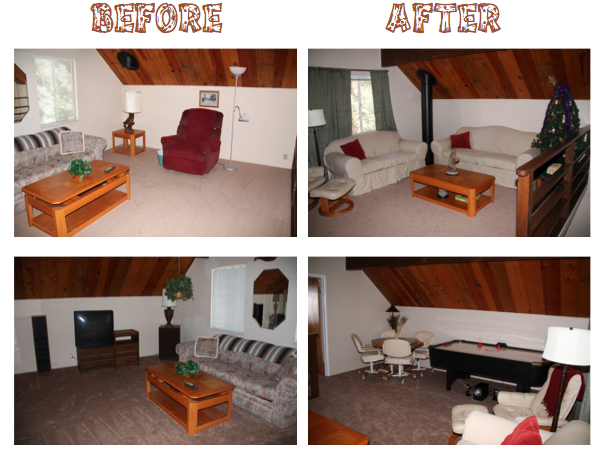 Let the first "room" that your guests walk into leave them with a lasting impression-and a good impression at that. Small spaces can be a challenge to decorate because you don't want to overwhelm the space, but you still need storage, function, versatility, and beauty. 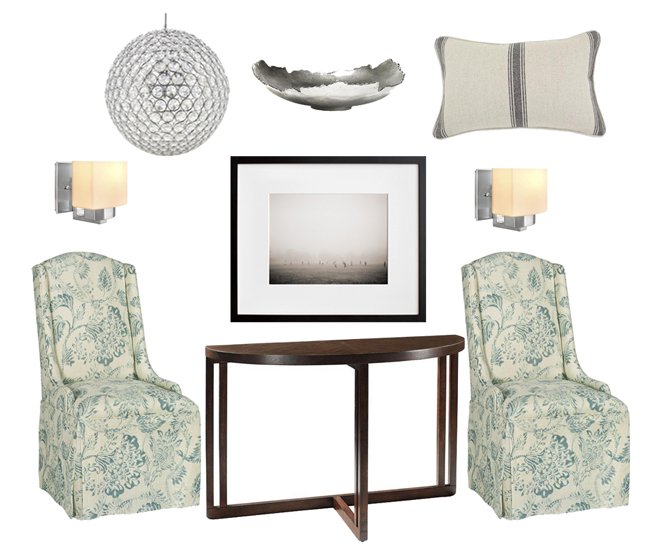 My house is definitely a small home, so I am constantly looking for inspiration when it comes to decorating various rooms in my house, or creative ways to create storage. I loved the idea of using floating shelves instead of nightstands-you still get the space you need for your lamp, clock, and books without losing the floorspace. Adding a mirror above the bed not only adds visual interest, but allows light to reflect through the room and gives the illusion of a larger space. Choosing a light colored linen and headboard will also help make the room feel larger, but don't feel like you must stick to light colors. If the room that you are decorating has a lot of natural light already, be more adventurous with your bed linens and see what works best for your space! Wish me luck on my endeavors as I take on my Guest Room/Office! I am not sure what it is about being on break, particularly summer vacation, but I ALWAYS end up with a massive "Honey Do" list that I create for none other than...MYSELF! This summer was no exception, excel spreadsheet and all. With fall just around the corner-my favorite time of year since it kicks off the holiday season-I always love to look for some inspiration to get my house into the spirit of the season. I love so many of these items because if you are feeling ambitious, you can turn many of these into a DIY, otherwise, you can find most of these items for purchase at Crate and Barrel, Pottery Barn, and Target! My husband and I were determined to purchase a piece of our version of paradise as soon as we could, especially with the market being in favor of the purchaser rather than the seller. We knew that we wanted a cabin in the mountains so that we could finally experience the closet thing that a Californian could to four seasons, and a white Christmas. We initially began our search in Lake Arrowhead, but soon realized that Big Bear Lake was where we would soon call home. After meeting with a Realtor and seeing three different homes, the Realtor called us a couple of weeks later with news on our dream home! We were out of town, but put in a full price offer without even seeing the place-fearing that if we didn't we would lose out on this amazing place. Sure enough, our offer was accepted, and we fell in love...with the potential! The changes that the house underwent included: changing out the flooring on the main level, adding a wood-burning stove, painting the entire interior, adding baseboards to the main level living area, adding a washer/dryer unit, changing the toilet, changing the sink/vanity in the bathroom, new kitchen cabinets and appliances, granite counter tops, new facets and sinks, new electrical outlet covers, new lighting throughout interior, and new furnishings. This little oasis amongst the trees is truly our little slice of Heaven, I feel so at peace every time that I am here. The first "room" in my house that I decided to decorate was the foyer. It is essentially the first "room" that everyone enters when they come into my house, and although it is not a large space-about a 6 foot by 8 foot area that has just enough room for a double front door entry, a door leading in from the garage, a coat closet, and a wall of space for decorating. The piece that inspired the decorating for this space is actually a beautiful piece of petrified wood that my husband and I discovered at the Petrified National Forest on our way back home to California from New Mexico. There are so many different shades of reds, browns, and blacks; so I wanted pieces that would enhance the natural beauty of this magnificent piece of history. I felt that because this is an actual piece of wood from an ancient tree, it seemed most fitting to have the artwork above the table be of a tree in a forest with the sun peeking through. The vases have a rather organic feel to them, as they are made of natural materials like bamboo and clay. The table that was used in the space fits perfectly as it is a semi-circle and has a glass top, the transparency of the glass top allows the small space to feel less cramped, which is important when trying to display so many various items. I love my little house, mainly because it feels like a home, and the room that is most near and dear to my heart is my little knight in shining armor's room-Trevor! He is so sweet, wonderful, polite, the light of my life, and naturally, as any toddler would be, full of energy, enthusiasm, curiosity, and life!!! 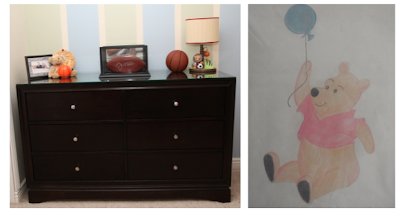 The inspiration for Trevor's room was actually a Winnie the Pooh drawing that my mom and dad made for me as a child. 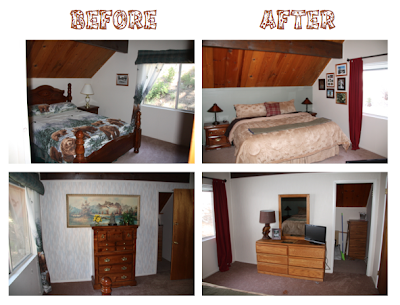 We wanted Trevor's room to be calming, welcoming, and to be a space that Trevor could grow into. My husband really wanted Trevor's room to be decorated in a sports theme, as he has determined that he will be an all-American athlete; and I wanted to decorate his room in safari animals-the compromise? Safari animals playing sports! We did a feature wall with the blue, yellow, and green that show up the most in his bedding, and then painted the rest of his room in a buttery yellow color and added his name in blue and green above his crib. We also had a mobile attached to his crib that matched his bedding, but have since taken it down, as he is no longer a 'baby' and has grown into a 'little man.' What child's room is complete without a rocking chair to read books at night in, a cozy lamp, and a beautiful changing table that doubles as additional storage in Trevor's room? I absolutely love this room, every time I walk inside of it, I get an instantly warm and happy feeling and know that it is the perfect place for the little man in my life to play during the day and rest his precious head at night. I am a hopeless romantic and I feel that the one place for me to allow myself to be completely and hopelessly romantic is none other than the master bedroom. 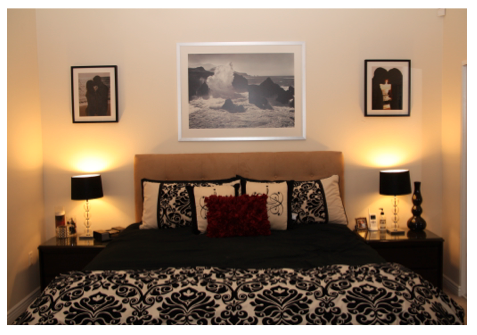 Our master bedroom has a simple theme-cream, black, and red-the same colors that we used in our wedding. These colors may seems simple, even boring to many, but for me, they have such significant meaning. The love that I share with my husband (symbolized by the red) is pure, simple and without complications. It is simple black and white, without any shades of grey. I love my husband more than anything else in this world and would do anything for him. I take marriage seriously and the day that I said "I do" was that day that I promised to stand by his side through the good, the bad, the ugly, the happy, the sad, the sick days, and the healthy ones; and in turn he would do the same for me. We have been together for almost fourteen years and have been married for four years, and we have already been through all of the above mentioned. All of those experiences, both good and bad, have brought me closer to him-made me realize what a strong, reliable, loyal, generous person I have married-and have made me a better person and wife for it. Because I so strongly agree with the sanctity of marriage and do not believe in divorce (at least for myself) I feel that it is important that our bedroom be a constant reminder of our love for one another and why we chose to ride this roller coaster of life together. Our nightstands are actually from Jonathan's childhood and when we got married we had them stained a dark espresso color to bring some new life into them, along with a matching dresser on the opposite wall. Atop each nightstand is a set of glass lamps with snake skin embossed lamp shades. On my husbands nightstand, also sits the jar of sand from the sand ceremony that we held at our wedding. 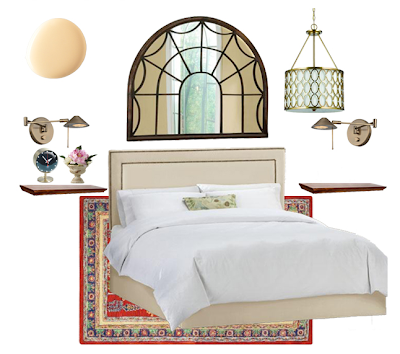 Our headboard is camel colored, suede, and tufted. We have a black bedskirt and comforter on our bed with a cream and black damask duvet at the foot of the bed and matching pillows at the head of the bed, and naturally a red rose petal pillow in the center of it all. Above our bed is a beautiful black and white picture of the waves crashing onto rocks in Laguna Beach, California. Flanking the beautiful photograph, are two fantastic engagement photographs of my husband and myself. So romantic!!!! I know, I know! I am so mushy, but I love it! Out of all of the places that I am allowed to be so mushy gushy, it should be the master bedroom. My advice to each of you is to put your heart into the room and allow the room to create a mood and feeling that you want to feel each and every time that you are in it. In my case, I spend so much of my time in my bedroom, sleeping and getting ready for the day, for a hot date with the hubby, or just passing thorough and each time I walk in, I feel instantly at peace with my life and reminded of how much in love I am with my man! This room is my pride and joy! It has a touch of modern architecture for my husband, beautiful natural slate in the tub, as you now know how much I love to incorporate nature into my decor somehow, and a touch of old hollywood glam for me. If I had to use one room in my entire house that described my style and personality, it would be the guest bath. It is understated and elegant, comfortable, well put together and exquisite. I absolutely love it! 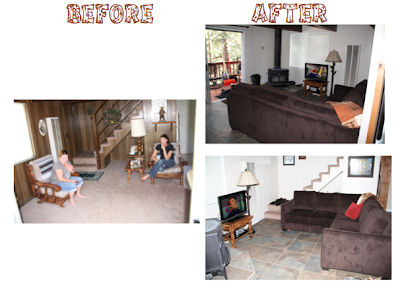 The very first thing that we did was decide on a color scheme. We knew that for this space we wanted to play with the grey tones, hence our immediate attraction to the slate that we chose for this space. 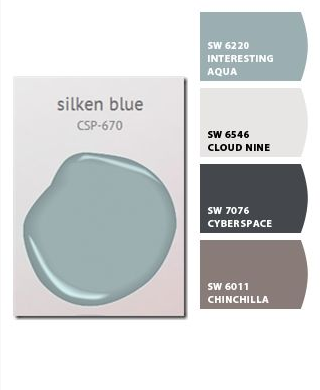 The paint color that we chose was a Valspar paint color called Twilight Moon. We painted our window sills and baseboards a high-gloss ultra bright white, so that the grey would really pop against the white. The tub is a Kohler porcelain tub perfect for giving my little prince baths in, it is enclosed in two clear glass seamless sliding doors, and is enveloped in ostrich grey slate from tub to ceiling all the way around the tub. You will also notice, that we did a simple, sophisticated design with the slate above the center of the tub to add a touch of visual interest. We also raised the level of the shower head so that our taller guests could comfortably shower and not have to worry about ducking in order to get under the shower head. The tub hardware is also Kohler in chrome and looks fantastic against the slate. The shower head is large and allows for our guests to feel as though the water is raining down upon them, giving them a great shower experience! The sink was an amazing find at Lowe's, as for one low price, it came with the espresso cabinet, peacock black granite counter top, the floating glass sink bowl (which is surprising low maintenance to clean), and the chrome faucet. 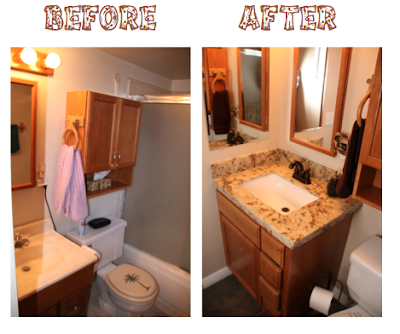 As soon as we saw this sink, my husband and I knew it would work perfectly in our guest bath and would really add the flare that we were looking to add for the bathroom. This beautiful piece is not just a sink, it is a piece of furniture. The gorgeous mirror above the sink serves two purposes. Not only is it beautiful, but it is also a medicine cabinet-pretty amazing! We cannot forget about the fantastic piece that pulls the whole bathroom together, and it is located above the sink-the light fixture. 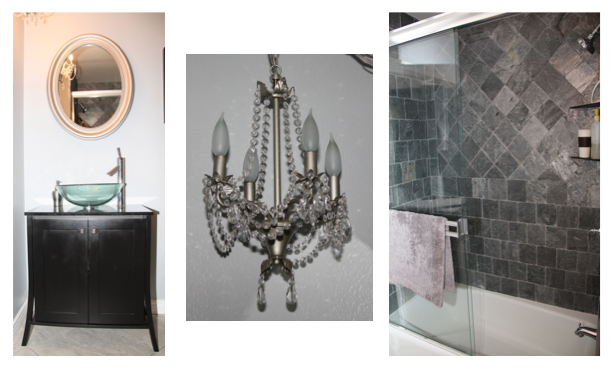 This gorgeous chandelier was given to my husband and I as a wedding gift from some of his classmates, and I knew that it would look perfect in the bathroom and give this space the perfect amount of glam that it needed. There is probably no room more important in any home than the kitchen. The Kitchen truly is the heart of my home, and with how my husband and I chose to design it, we opened it up to the dining room and family room to create a great room which allows me to be able to interact with the family no matter where they are while I am in the kitchen. Being that I love everything about food, from shopping for it, finding new recipes, cooking, baking, and of course eating it, I wanted to create a space that would be my dream come true and that's what my husband and I accomplished. With a perfect triangular workspace between the stove, sink, and refrigerator, a large island that doubles as a workspace and an additional eating area, a double oven, a wine fridge with a separate space for our reds and whites, and tons of storage amid the beautiful custom built ash wood cabinets stained in an espresso finish, this is a space that I never want to leave! All of our appliances are Kenmore Elite purchased from Sears on none other than Black Friday, as a result of waiting to purchase our appliances on this particular day, we saved more than 25% on our total purchases, which was completely worth it to us! I was very particular about the purchase of my appliances as this was such a huge investment and these would be used on a daily basis. I knew that I wanted a French Door Stainless Steel refrigerator so I could store large items in the fridge at any given time, which is necessary for me as I enjoy entertaining a great deal. I also knew that I wanted my dishwasher to be stainless steel as opposed to plastic on the inside for durability purposes. I chose a large single basin sink, which was probably my favorite purchase as it is easy to clean, very conducive for cleaning large quantities of dishes, and is perfect for bathing new babies! By choosing to do a five burner stove top, it allowed us to add more cabinetry underneath and add a double oven on the wall, which was very important to me as I love to cook and bake, and having two ovens during the holidays is a must. What is a kitchen without the personal accents? 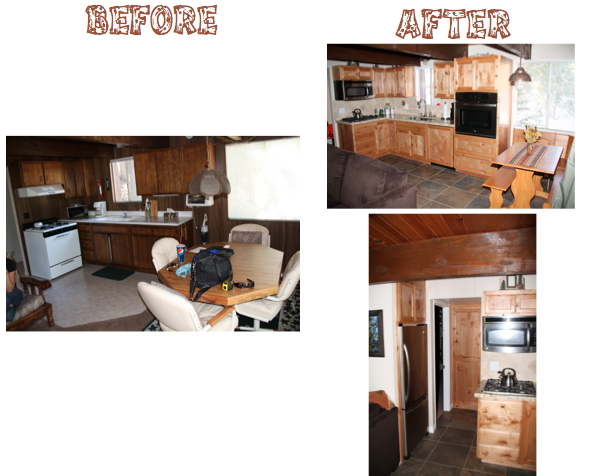 I felt that my kitchen is not only an extension on myself, but of my home as well, and since it is open to the entire house, it was important that it be well decorated-and appropriately decorated-to suit not only the house, but also the space. 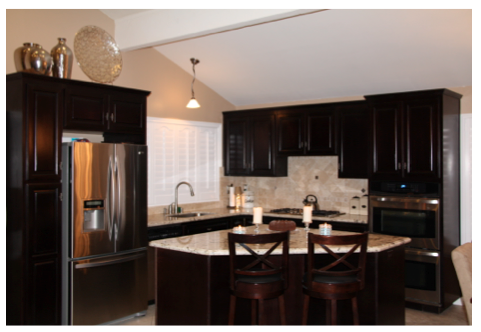 Which is why I chose to add touches to island, the space above the refrigerator, and the countertops. I also carried the theme onto the dining table and the wall above the dining table. Our art is a reflection of the space, old wine bottle openers flanking a painting of a wine bottle. It is simple, but to the point, our space is used for gathering with the people that we love to eat good food, drink great wine, in the company of fabulous friends and family.